The residents of Auckland at first thought that a Russian man-of-war had commenced bombing the city. The blast was felt as far south as Christchurch too. 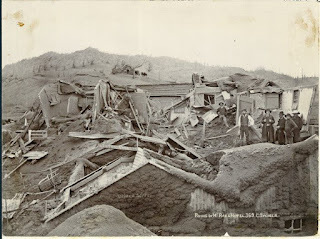 In the early hours of 10 June 1886, Mt Tarawera, some 24 kilometres southeast of Rotorua, erupted with a terrible force. There had been little prior warning, though ten days before the disaster a phantom waka full of warriors had been seen on Lake Tarawera. In the aftermath of the eruption 153 people officially lay dead – all but six of them Maori. Much of the Bay of Plenty was covered in ash and mud. Miraculously, initial reports out of Rotorua suggested that Otukapuarangi (‘fountain of the clouded sky’) and Te Tarata (‘the tattooed rock’) – better known to Europeans as the Pink and White Terraces – had escaped unscathed. Five days later the terrible truth was revealed, when a telegram from the Rotorua postmaster announced that it was ‘quite a decided fact that the terraces exist no longer.’ Among many global contenders, the dazzlingly beautiful silica terraces (the largest and most spectacular of their kind anywhere) had been acclaimed by visitors who saw them as the true ‘Eighth Wonder of the World’. Suddenly they were no more. 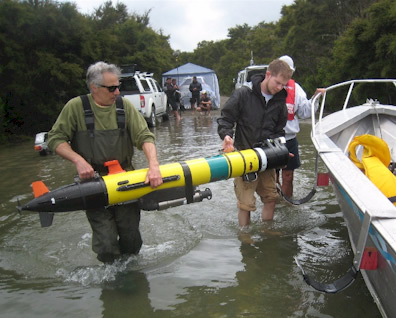 Or at least that was the assumption until a recent GNS-led expedition, undertaken in association with local iwi, along with the Woods Hole Oceanographic Institution from America and other institutions. In February 2011, scientists from the group discovered the bottom section of the Pink Terraces, still intact but submerged under 60 metres of water in Lake Rotomahana. The remarkable finding – undertaken using an unmanned miniature yellow submarine also employed by the US Navy to clear off mines – came months before the 125th anniversary of the devastating eruption in June 2011. 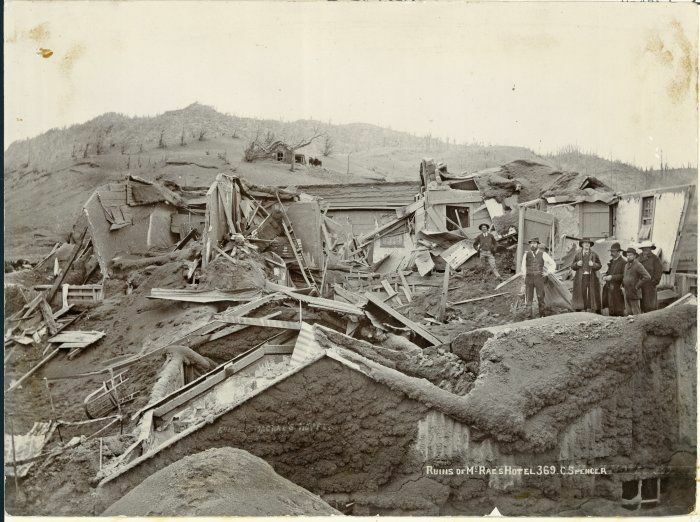 For the people of Te Arawa, one-time kaitiaki (guardians) of the terraces, the discovery served as a painful reminder of the many ancestors killed in the disaster. But it also brings back into relief a time before the eruption when Te Arawa were pioneers in a tourist industry that now contributes 10 per cent of New Zealand’s total GDP. Their story deserves to be better known. It all began modestly enough, with a few hardy tourists finding their way to the terraces in the 1840s and 1850s. 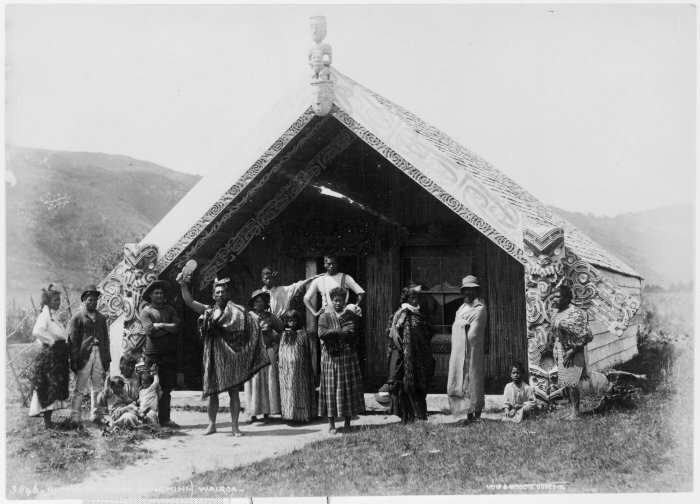 Customary Maori hospitality dictated that manuhiri (guests) should be fed and looked after, and some visitors reported that their Te Arawa hosts and guides positively refused payment for their assistance. Inevitably, it did not take long for others to leave the district in disgust, bitterly complaining of ‘native extortion’ and ‘blackmail’. Their cries were to be repeated by many subsequent visitors, who resented Maori ownership and control of not just the terraces but also the many geysers, hot pools and other natural wonders of the Rotorua region. Massive local and international press coverage and attention followed the 1870 visit to the area of the Duke of Edinburgh, Prince Alfred. 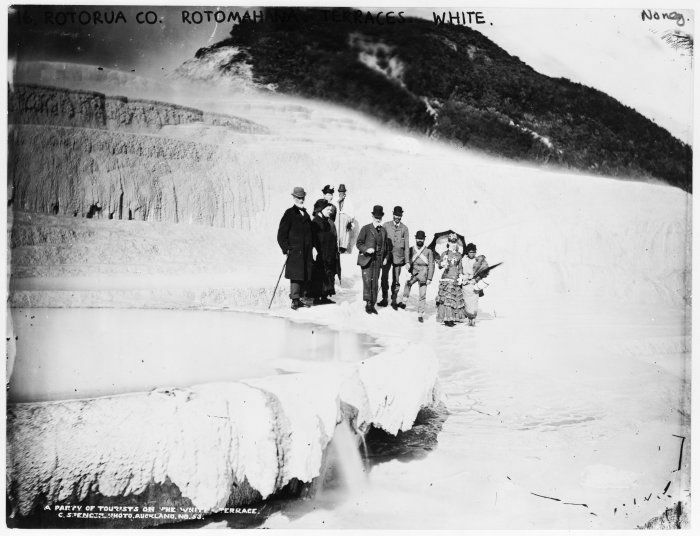 Almost overnight, an organised tourist trade came to life and with the local waters widely believed to have healing properties, Rotorua’s future as a sanatorium and tourist destination of global repute seem assured. Little wonder perhaps, given that by this time Te Arawa were estimated to be earning up to 6000 pounds annually (close to $1million in today’s terms) from their control of the tourist trade. 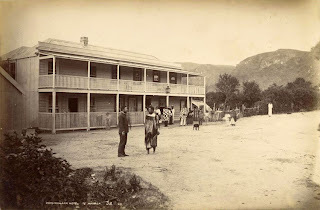 Although many hotels and stores were run by Pakeha, they were usually owned by Te Arawa, who otherwise charged rentals for the use of the land they were built upon. 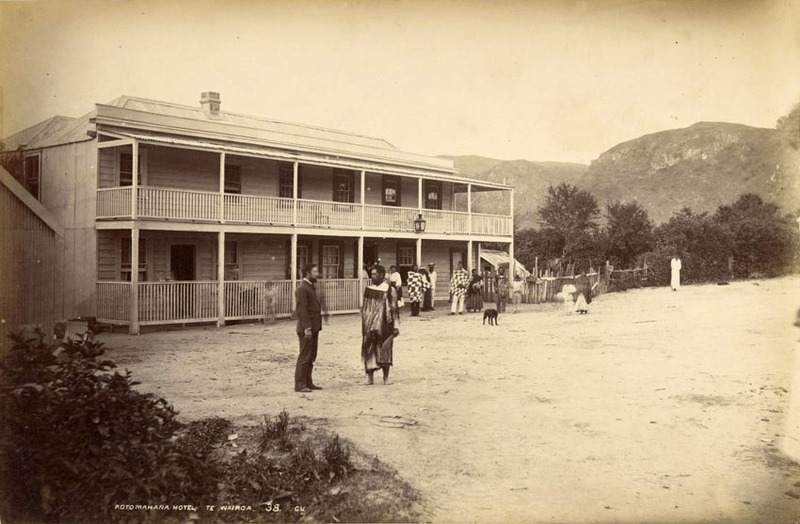 Visitors to the terraces or springs were also required to pay a toll for access, as well as further fees for guides. Te Wairoa, the final departure point for the terraces and today home to the Buried Village, quickly became one of the richest Maori communities in the country. Hinemihi, the meeting house constructed at Te Wairoa in the early 1880s, epitomised the prosperity then experienced by the community. Gone were the paua shells that normally represented the eyes of carved ancestors, replaced instead by gold sovereigns. Even this proved a shrewd investment. Tourists would pay a shilling to visit Hinemihi with its golden eyes. The house today stands at Clandon Park in Surrey, after being purchased by the Earl of Onslow in the early 1890s as a souvenir of his time as Governor General of New Zealand, a forlorn if fitting reminder of the cataclysmic events that had led to the abandonment of Te Wairoa. Indolence and debauchery were soon added to Te Arawa’s supposed list of sins. One 1885 guide to the terraces declared that their owners had ‘ceased to grind or cultivate the golden grain, preferring to cultivate the acquaintance of the Pakeha, and see what amount of gold they can grind out of him’. The owners of the terraces could purchase all of the flour and other supplies they needed at their local store, leaving them free to concentrate on the more lucrative tourist trade. Pakeha called this shrewd business, but when applied by Maori at this time it was nothing less than extortion. Europeans also sometimes objected to the fees demanded of them before being allowed to sketch or take photographs of the terraces. Yet in a forerunner of later intellectual property rights arguments, Te Arawa argued that, as most photographers and artists intended to sell their images, it was only right that they, as guardians and owners of the terraces, should receive a share of the profits. Double-standards abounded when it came to Maori ownership of the jewels in the nineteenth century New Zealand tourist trade. Yet Te Arawa remained keenly aware of their entitlements and by these means were able to extract a decent income out of the tourist trade. An appeal addressed to ‘all the Maori People of Aotearoa’ for assistance met with an overwhelming response. Casks of mutton birds were sent up from the south, preserved eels and albatross from the Chatham Islands, potatoes from all over the South Island, and kumara, bacon, tea, flour and other supplies from around the North Island. Iwi across the country offered land for the survivors to resettle upon. Te Arawa hapu that had escaped destruction also incurred considerable debts in sheltering their refugee kin from Rotomahana. The government’s response was decidedly more calculating. 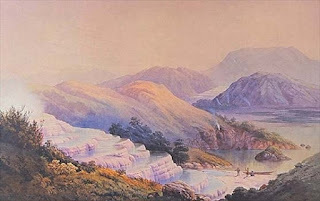 It determined that, although the Pink and White Terraces were now gone, the area was still likely to attract tourists. Given the desperate plight of its owners, there now seemed a better prospect than ever of acquiring the long-coveted land. Besides a small sum granted for immediate relief purposes, it was therefore decided that any other money or assistance offered Maori should be ‘in the form of payment for their land or labour’. By contrast, the smaller number of Pakeha directly impacted by the eruption were not required to construct roads or sell their ‘surplus’ lands in order to obtain relief. Delays in issuing legal titles for the lands complicated such plans, though by the early twentieth century most of the area had passed into Crown ownership. Their former owners were meanwhile described as a landless people, leading a nomadic lifestyle on the gumfields of Northland but without any fixed abode. Others resettled with relatives at Whakarewarewa. There, using all their skills as guides and tourist entrepreneurs, they were able to earn a moderate income. But it did not take long for the old complaints of ‘native extortion’ to return, and within a few years of this the government had employed considerable legal chicanery in order to purchase the most valuable springs. Tolls for entry on to the lands were abolished and guiding activities became subject to increasingly strict regulation. Whakarewarewa, once described as a healthy and clean community, had by the early twentieth century become a ‘hot-bed of stench and decomposing filth’. In an indication of the depths of poverty into which many of its inhabitants had sunk, a number of cases of typhoid fever were reported. These prompted the Minister of Public Health to express alarm at the ‘constant danger to the health of the European population’ which this constituted. Sick Maori were not a good look for the tourist industry, especially if they happened to contaminate their wealthy visitors with one of the leading diseases of poverty. Thanks to the government’s efforts, within less than two decades from the time of the Tarawera eruption Te Arawa had been transformed from owners and managers of the most lucrative tourist trade in New Zealand into essentially strange and exotic objects for European visitors to mock and stare at. 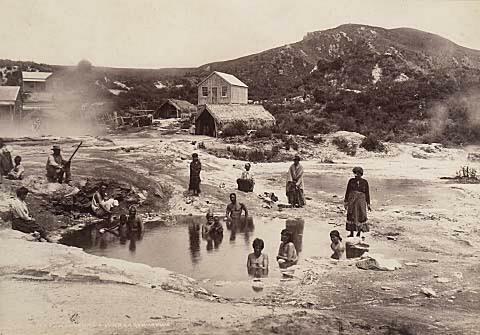 The children might earn a little money through dancing ‘penny haka’ for the tourists, or diving for coins in the Puarenga Stream, and those of their mothers luck enough to receive a guiding license could usually expect a reasonable income from this source. But besides a few concert parties, and making souvenir tiki or carved ashtrays for tourists, or working in European-owned hotels, that was about it in terms of the industry they had once controlled. The effective exclusion of Te Arawa from the ownership and control of most major tourist assets in the Rotorua region has very slowly begun to be reversed in the last two decades. With the recapitalisation of the iwi through recent Treaty settlements they may even one day reassume their previously dominant position in the sector. Otukapuarangi, which sits under one of 13 lakes returned to Te Arawa ownership in 2006, perhaps serves in this respect as a reminder of the old Maori saying about walking backwards into the future. For more on the story of Te Arawa and the tourism industry see Vincent O'Malley and David Armstrong, The Beating Heart: A Political and Socio-Economic History of Te Arawa (Huia Publishers, 2008). Click here for more details. This is fascinating comment, Vincent. There is so much puff and blather going on about the disappearance of the Pink and White Terraces this past year, but I haven't seen anything else that explores the political and social consequences of that upheaval. A new and thoughtful angle. Thanks. Very interesting article -- I was interested in the images you've shared and where they are from. Could you possibly share the titles, dates, etc of them? Thanks. Yes, sorry. As this was my first post I hadn't quite mastered things like captions at that point. 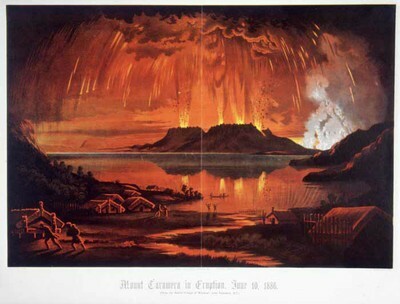 All of the images are from the National Library of New Zealand, and date from around the 1870s and 1880s, so either shortly before or after the Tarawera Eruption. If you do a search on the NLNZ website (http://natlib.govt.nz/) you should be able find them. When I have a chance, I will go back and enter caption details. Hi Vincent, a nice review. You may now consider extending the article to include our latest research findings on the Pink, Black and White Terrace locations.